4 Bedroom End of Terrace House For Sale in Bournemouth for Asking Price £315,000. 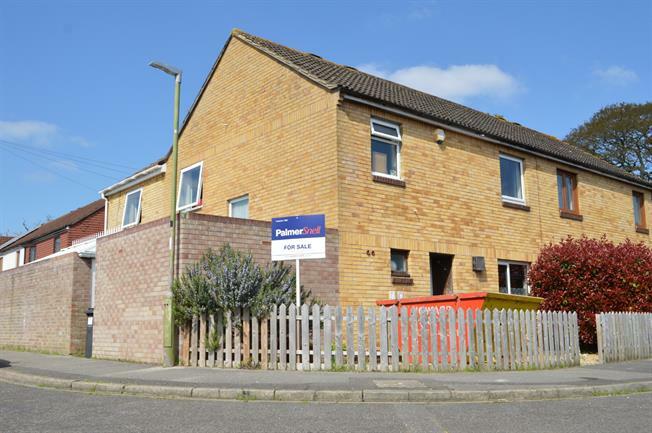 NO FORWARD CHAIN - Palmer Snell are pleased to offer this extended and spacious 4 double bedroom end terraced house with 3 reception rooms situated in a cul-de-sac location close to JP Morgan, Bournemouth Hospital and Castlepoint. The accommodation comprises a spacious entrance hall, downstairs WC, 14' lounge open planned with a 21'7" dining area and a 14' kitchen, 19'2" conservatory, utility room, 4 first floor double bedrooms, bathroom with bath and shower, southerly facing rear garden and parking. Via UPVC double glazed door. Window to front Radiator. Stairs to first floor. Doors to accommodation. Low flush WC. Wash basin. Tiled walls and floor. Open planned with the dining area and kitchen. UPVC double glazed window to rear aspect. TV point. Radiator. UPVC double glazed French doors to rear garden. 2 radiators. Space for table and chairs. Storage cupboard. Arch through to kitchen. Double doors to conservatory. UPVC double glazed window to front aspect. Range of wall and base units. Sink. Space for appliances. Central heating boiler. Brick built. Pitched roof. French doors to rear garden. Radiator. Arch through to utility. Frosted UPVC double glazed window to side aspect. Space for appliances. UPVC double glazed window to side aspect. Loft hatch. Airing cupboard. Doors to accommodation. 2 UPVC double glazed windows to rear and side aspect. Built in wardrobes and dresser. Radiator. TV point. Frosted UPVC double glazed window to front aspect. Wash basin. WC. Shower in cubicle. Bath with shower attachment. Tiled walls and floor. Heated towel rail. The rear garden faces in a southerly direction with a patio off the property with steps up to a further patio area and artificial lawn. Gate leading out to the road with parking just behind on a first come first serve basis. Brick built. Accessed via side. Power and lighting.